Our Alphabet Sampler Birth Record is a classically styled sampler in pretty pastel colors, just perfect for the nursery! Your counted cross stitch design makes a thoughtful gift and can be personalized with the baby's name, birthdate, weight, and parents' names. Finished size: 9 x 12 (22 cm x 30 cm). This counted cross stitch kit contains: presorted cotton thread, 14 count ivory Aida, needle, easy.. Counted Cross Stitch Kit with Chart, Embroidery Fabric: 100% cotton, Yarn: 100% cotton DMC, 5,4 stitches/cm - 14 count, Yarn organizer, Instruction in four/ eight languages, Large-square charted design, Needle, Frontsheet picture, ca. 26 x 19 cm / 10.4" x 7.6", Age category: from 9 years, Stitches: cross stitch, back stitch.. Counted Cross Stitch Kit with Chart, Embroidery Fabric: 100% cotton, Yarn: 100% cotton DMC, 5,4 stitches/cm - 14 count, Yarn organizer, Instruction in four/ eight languages, Large-square charted design, Needle, Frontsheet picture, ca. 22 x 27 cm / 8.8" x 10.8", Age category: from 8 years, Stitches: cross stitch.. Counted Cross Stitch Kit with Chart, Embroidery Fabric: 100% cotton, Yarn: 100% cotton DMC, 5,4 stitches/cm - 14 count, Yarn organizer, Instruction in four/ eight languages, Large-square charted design, Needle, Frontsheet picture, With alphabet, ca. 22 x 20 cm / 8.8" x 8", Age category: from 9 years, Stitches: cross stitch, back stitch..
A sweet duo announces the arrival of a special little one in our Baby Animals Birth Record. This stamped cross stitch kit contains presorted cotton thread, design printed on white polyester/cotton sailcloth, needle, and easy instructions with an alphabet and numbers for personalizing. Finished Size: 12" x 9" (30 x 23 cm). Designed by: Ruth J. & Bill D. Morehead. The Morehead Collection™. .. This tender little teddy is happily announcing the arrival of that special newborn. The design is stitched on 14 count white Aida with cotton thread. Kit includes an alphabet and numbers for personalizing. -- Finished Size: 5" x 7" (13 x 18 cm) -- Designed by: Todd Trainer..
Our cute Baby Dots Birth Record features a baby bottle, duck, pacifier and diaper pin. This clever design in counted cross stitch can be personalized with the baby's name, birthdate, weight, length and eye color. Thread included to stitch for a girl or a boy. Finished size: 10" x 10" (25 cm x 25 cm). 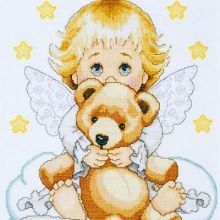 This counted cross stitch kit contains: presorted cotton thread, 14 count beige Aida, needle, eas..
A profusion of soft cuddly toys and a brightly painted dresser make this counted cross stitch Baby Drawers Birth Record perfect for a boy or girl. A charming gift any new mother can love. This counted cross stitch kit contains presorted cotton thread, 14 count white cotton Aida, needle, and easy instructions with an alphabet and numbers for personalizing. Finished Size: 9" x 12" (23 x 30 cm).. This adorable Baby Elephant ABC design in counted cross stitch from Dimensions is a great nursery gift to celebrate a new arrival! Alphabet included to personalize the colorful pennant border with the child's name. Finished size: 10" x 10". Designed by Jo Moulton. © Jo Moulton and Sagebrush Fine Art, Inc. Salt Lake City. Counted cross stitch kit includes: • Presorted cotton thread • 14 count ivo..
All aboard! This fun-filled train is ready to pull out. Adorable animals and bright colors combine to make this counted cross stitch birth record a standout. Kit contains cotton thread, 14 count white Aida, needle, and easy instructions with an alphabet and numbers for personalizing. Designer: Debra Jordan Bryan.. Counted Cross Stitch Kit with Chart, Embroidery Fabric: 100% cotton, Yarn: 100% cotton DMC, 5,4 stitches/cm - 14 count, Yarn organizer, Instruction in four/ eight languages, Large-square charted design, Needle, Frontsheet picture, With alphabet, ca. 13 x 19 cm / 5.2" x 7.6", Age category: from 9 years, Stitches: cross stitch, back stitch.. Counted Cross Stitch Kit with Chart, Embroidery Fabric: 100% cotton, Yarn: 100% cotton DMC, 7 stitches/cm - 18 count, Yarn organizer, Instruction in four/ eight languages, Large-square charted design, Needle, Frontsheet picture, With alphabet, ca. 14 x 16 cm / 5.6" x 6.4", Age category: from 10 years, Stitches: cross stitch, back stitch.. Counted Cross Stitch Kit with Chart, Embroidery Fabric: 100% cotton, Yarn: 100% cotton DMC, 7 stitches/cm - 18 count, Yarn organizer, Instruction in four/ eight languages, Large-square charted design, Needle, Frontsheet picture, ca. 20 x 18 cm / 8" x 7.2", Age category: from 10 years, Stitches: cross stitch, back stitch.. This endearing Baby Hippo 123 design in counted cross stitch from Dimensions is a great nursery gift to celebrate a new arrival! Alphabet included to personalize the colorful pennant border with the child's name. Finished size: 10" x 10". Designed by Jo Moulton. © Jo Moulton and Sagebrush Fine Art, Inc. Salt Lake City. Counted cross stitch kit includes: • Presorted cotton thread • 14 count ivory.. Counted Cross Stitch Kit with Chart, Embroidery Fabric: 100% cotton, Yarn: 100% cotton DMC, 5,4 stitches/cm - 14 count, Yarn organizer, Instruction in four/ eight languages, Large-square charted design, Needle, Frontsheet picture, With alphabet, ca. 22 x 28 cm / 8.8" x 11.2", Age category: from 9 years, Stitches: cross stitch, back stitch..